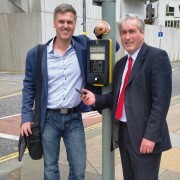 East Lothian MSP Iain Gray has welcomed the innovation of an entrepreneur seeking to make pedestrian crossing systems easier for the disabled and the blind. Gavin Neate, who worked for Guide Dogs for the Blind for 18 years, has invented a phone app called Neatebox, that links phones to boxes inside crossing systems, letting the user control it easily from their phone. The phone then tells them when it is safe to cross via a message on the screen, audio or vibration. Currently, pedestrian crossings require disabled or blind users to hold a cone at the back of the crossing post, which alerts them when it is safe to cross. This can make organising a guide dog or walking stick tricky, costing the pedestrian vital seconds needed to cross safely. In other cases the cone cannot be reached in the first place. “This is a fantastic idea, and I hope that local authorities will get behind rolling it out to more of their pedestrian crossings when it is completed. “Navigating a pedestrian crossing can be so difficult for people with mobility problems or visual impairment, in ways that many of us will never properly understand. 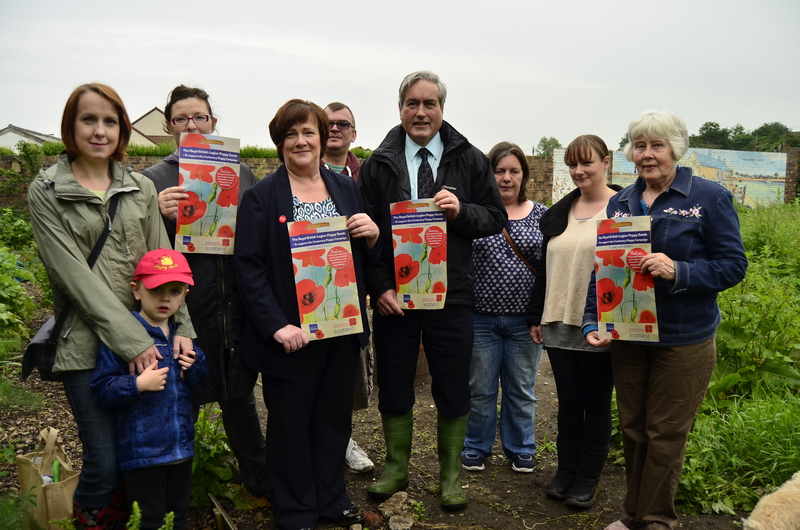 Iain Gray MSP and Fiona O’Donnell MP have joined members of the Friends of Cuthill Park to mark the forthcoming anniversary of the start of the First World War by sowing poppies at the park in Prestonpans. The Centenary Poppy Campaign is a simple but highly appropriate way to mark the start of the First World War locally, raising awareness and funds for today’s Service community at the same time. The aim of the campaign is to cover the UK with poppies during the Centenary period in commemoration of all those who lost their lives in the First World War. Packets of Centenary poppy seed are available from B&Q with £1 from each sale going to the Royal British Legion and Poppy Scotland. The intention is to sow poppies now so that they should appear in time for the official start of the Centenary in August. “Following on from the recent 70th anniversary of D-Day, the Centenary of the start of the First World War is another opportunity to remember those who paid such a high price in the service of their country. “The Centenary Poppy Campaign is a simple but highly effective way to mark the Centenary and I want to thank the Friends of Cuthill Park for working with us to sow some there. The red poppies have such a close association with remembrance and I hope will bloom for many years to come. 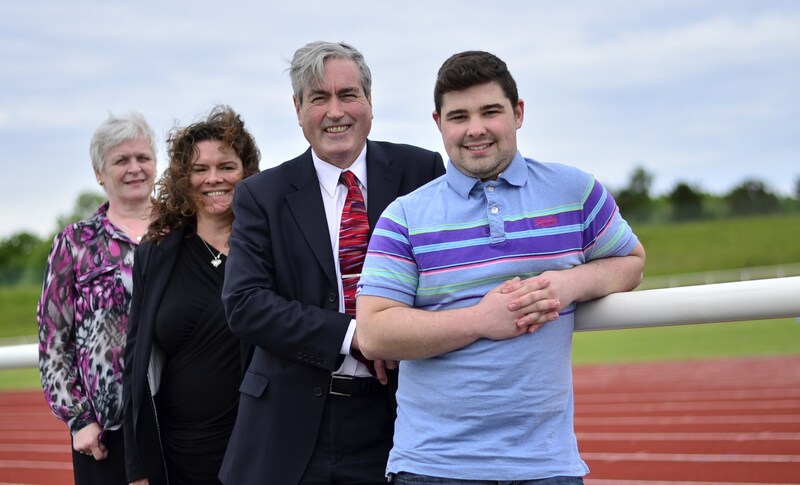 As part of this year’s Carers Week (9-15 June), Iain Gray MSP and Fiona O’Donnell MP joined other local politicians to hear first-hand from people looking after friends and family about the kinds of challenges they face. A group of 20 local carers met with the politicians at a summit meeting in Musselburgh at the start of the week. The meeting was organised by Carers of East Lothian, the local carer support service. “It is many years now since I launched the very first Scottish Carers’ Strategy as a Health Minister. Yet many issues such as respite availability and the difficulties of negotiating with the NHS, Social Work and DWP still make too many carer’s lives difficult or even impossible. 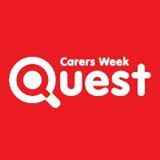 Carers Week is an important opportunity to put the focus on carers again and listen to their concerns. “Carers Week is all about giving carers an opportunity to be heard and this event certainly did that. It was good to hear about the experience of young carers who can all too easily be forgotten in planning and developing services. “We heard a clear message that we need to improve communication with carers and to enable them to play a bigger part when the person they care for is being assessed for a service. They can make a unique contribution and that needs to be valued more. County MSP Iain Gray met the owners of local business James Sandie and Son at a recent Holyrood reception to mark the 50th anniversary of CITB, the Industry Training Board for the UK construction industry. 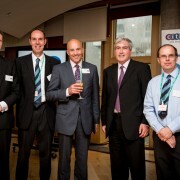 Painting and Decorating Business of the Year at the Scottish Decorators Federation in 2013. Murray Stewart is also a former President of the Federation. CITB are the Industry Training Board and a partner in the Sector Skills Council for the construction industry in England, Scotland and Wales. They work with industry to encourage training, which helps build a safe, professional and fully qualified workforce. “It was good to welcome Murray and Colin to the Scottish Parliament and learn more about their business. They underlined the importance of apprenticeships in the construction industry and CITB have been working to ensure that construction employers have the right skills, in the right place and at the right time for 50 years now. Last week was Scottish Apprenticeship Week, marked by a series of events organised by the Scottish Government and Skills Development Scotland to celebrate and promote apprenticeships. I am a big fan of apprenticeships and training. So is my party. In government and in opposition we have pushed for more high-skilled apprentices. Their value to Scotland’s workforce is so significant, from engineers and technicians, through to skilled workers in the tourism and service sector. East Lothian is well placed to take advantage of the apprenticeship scheme too, and, earlier this year, the council created a further 12 places, along with 30 six-month, paid training places. In 2012/13, there were 387 apprentices from the county in all. Locally Enjoy Leisure have also begun an apprenticeship programme. But while we are celebrating the value of modern apprenticeships, it is a good time to ask how we maintain and improve that. Audit Scotland looked at this in March and produced a detailed report. Firstly, it explained that once apprentices have completed or left their training, we don’t know what they do next. If we want the best from the scheme, we have to have hard data on whether training helped apprentices get a job and keep it. Secondly, the report recommended that funding for higher-level apprenticeships should be monitored, to make sure money is there to deliver them. At the moment, the government is producing more apprentices than Labour did in power, but 1000 fewer high-level opportunities, and spending £860 less per apprentice than in 2006/07. But while Audit Scotland’s points challenge the government to do better, the value of the scheme is not in doubt. For anyone interested in becoming an apprentice, they should visit www.myworldofwork.co.uk, or call Skills Development Scotland on 0800 917 8000. Employers looking to take on an apprentice should visit www.ourskillsforce.co.uk, or call 0800 783 6000. 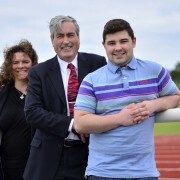 Iain Gray MSP has signed up to support gold standard management for epilepsy care during this year’s National Epilepsy Week (18-24 May). 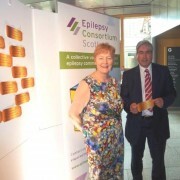 The county’s MSP met Epilepsy Consortium Scotland representatives at the Scottish Parliament and signed a gold standard ticket to highlight new SIGN national guideline on managing epilepsy in adults, and to mark the annual awareness week. The new national guideline for managing epilepsy in adults is due out this autumn. The guideline has been developed by leading experts in the field and sets the benchmark for the highest standard of care. Epilepsy Consortium Scotland is calling for each health board across Scotland to put it into practice and address the current treatment gap where nearly two in ten people with epilepsy could become seizure free if they received optimum care. County MSP Iain Gray showed his support for Scottish Apprenticeship Week (19-23 May) today by meeting a local apprentice with enjoyleisure. Mr Gray met with Ross Galloway who is doing his Modern Apprenticeship at Meadowmill Sports Centre and Debra Tracy from Direct Partners, the company which is helping to provide the training. Ross is one of two apprentices Enjoy currently have working with them in East Lothian, but are planning to recruit a further six. Scottish Apprenticeship Week is an annual awareness event to celebrate and promote apprenticeships. Businesses, trade associations, training providers, colleges, local authorities and other partners back the week by holding events and promoting the benefits of Modern Apprenticeships. “Modern Apprenticeships offer fantastic opportunities for young people to undertake work-based training. They are available across many different industries and cover a wide range of skills. They can also bring lots of potential benefits to employers by providing support to train new and existing staff. Iain Gray MSP met with representatives of the Children’s Hospice Association Scotland (CHAS) at Holyrood last week and pledged his support for their vitally important work. CHAS is a charity that provides the only hospice services in Scotland for children and young people with life-shortening conditions. They run two children’s hospices, Rachel House in Kinross and Robin House in Balloch, which support the whole family by offering short planned breaks, emergency support, end of life care and a range of bereavement services. 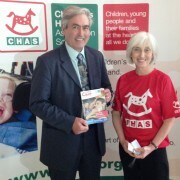 “A huge thank you to all 56 MSPs who pledged to support CHAS during our week at the Scottish Parliament. We are really looking forward to welcoming those MSPs who pledged to visit Rachel or Robin House to our hospices or CHAS at Home service and wish those who pledged to raise awareness of CHAS by holding a fundraising event in their local community during Children’s Hospice Week all the best with this challenge. The money raised from these events will help the hundreds of children, young people and families who use the CHAS services. The living wage should be more actively promoted says East Lothian MSP Iain Gray, after figures showed that 90% of Scots think that companies should pay the living wage. There are over 4600 people in East Lothian paid less than the living wage, currently set at £7.65 an hour. It would mean an annual raise of £2,600 for those working full-time on the minimum wage. Iain Gray MSP is a long time campaigner for the living wage and says the time has now come to actively promote the payment of it in the private sector, and has urged the Scottish Government to back a tax rebate for firms who pay it, as well as establish a National Living Wage Strategy. Last week proposals from Scottish Labour to deliver the living wage to workers on public contracts were defeated as the SNP and Conservatives voted to block amendments to the Procurement Reform Bill. “The living wage cannot be something the Scottish Government pay lip service to. The SNP voted with the Tories to block Labour proposals to deliver a pay rise to cleaners, caterers, retail and other staff working on public contracts across Scotland. 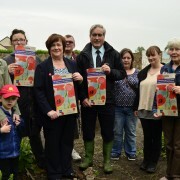 “The living wage is good for our communities and good for our economy here in East Lothian. It is vital that we do more to promote it. Local MSP Iain Gray met with a team of pupils from Dunbar Primary School this week as they represented the county at the Euroquiz final at the Scottish Parliament. The annual event, which is run by the Scottish European Educational Trust (SEET), took place on Monday in the Debating Chamber of the Parliament. Mr Gray met up with the Dunbar pupils before the contest got underway to give them his support and best wishes. The event was watched by well over 100 spectators from the gallery and countless more who were watching at home via a live stream to support their local teams. The teams had to try and answer questions on a range of subjects connected to Europe, including languages, history, culture and sport in a bid to win the top trophy prize. SEET has been running the quiz since 1993 and this is the seventh year the event has been held at the Scottish Parliament. It is sponsored by the European Parliament and also the Scottish Government. Unfortunately, the Dunbar team did not manage to win in the end, but Mr Gray praised them for their achievement in representing East Lothian so ably in the final. “Euroquiz is a fun and interactive way for school children across Scotland to learn more about Europe and its culture, history and sport. 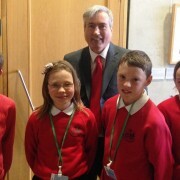 I was really pleased to welcome the pupils from Dunbar Primary to Holyrood for the final, and want to congratulate them for their hard work in preparing for it.